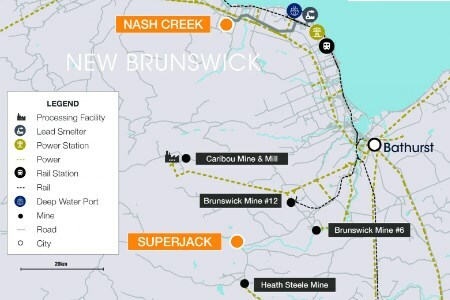 Callinex Mines Inc. has announced preliminary results from its ongoing district-scale induced polarisation (IP) survey at the company’s 100% owned Nash Creek Zinc project (the project) located in the Bathurst Mining District of New Brunswick, Canada. The IP survey commenced at the northern grid located approximately 1 km east of the Nash Creek Deposit. Preliminary results have identified a significant target area that spans approximately 1900 m x 400 m and appears associated with a synclinal repetition of the Nash Creek Deposit. The footprint of this target area compares favorably to the IP signature associated with the Nash Creek Deposit. Callinex completed two holes to evaluate the conductive responses modelled in the target area and both holes intersected various amounts of sulfide mineralisation that has potential to host zinc and lead mineralisation. The intersected depth of the sulfide mineralisation correlates well with the modelled chargeability and samples have been sent to the lab for analytical testing. The company anticipates that this target area will be thoroughly drill tested in the next drill programme after the larger IP survey has been completed. Targets generated from previous IP surveys over the Nash Creek Deposit have shown a very high correlation to the current mineral resources. To date, approximately 65 line km have been completed as part of the survey and it is anticipated that the remaining 110 line km will be completed within 90 days due to slower than anticipated production. The company has also completed its ongoing drill programme which consisted of 23 holes totalling approximately 4750 m. It is planned that significant drilling will occur to follow up on IP targets associated with this survey in the spring of 2019.